The Little Nell wine team gathers in the new wine cellar for a tasting. This winter we’re debuting our most intimate epicurean experience to date with private tastings in our 20,000 bottle wine cellar. Upon making a reservation, guests receive a consultation with McCoy, who ascertains likes and dislikes and comes up with a theme for the tasting. “If you like Burgundy, it will be a Grand Cru flight, and if wines from Spain that make you happy, we’ll assemble some amazing riojas,” McCoy explained. Guests may explore a special vintage, favorite region or desired producer, or they may simply leave it up to one of the master sommeliers to create a surprise experience on the fly. The wine accompanied by an Iberian ham and served on a hand-crafted table made from Colorado beetle-killed pine and vintage wine barrels. The personalized evening inside the hotel’s Wine Spectator Grand Award-winning wine cellar is custom pricing. 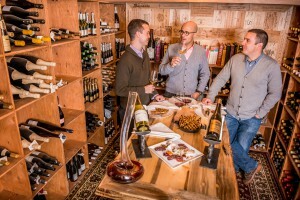 The cellar may accommodate tastings for up to six people at a time. Après ski tasting anyone? Give a call to Carlton if you want to try it out! 240-620-2146.